One of Mexico’s most powerful criminal organizations, the Jalisco cartel has invaded Wixárika territories in northern Jalisco and the surrounding states in the last year, displacing local residents or forcing them to grow opium. The situation is getting worse. The Wixárika have policed their own communities for generations but locals in Tuxpan de Bolaños have had to step up their patrols since the beginning of the year, citing a lack of protection from the state. Despite the community’s resistance, the murder of the Vázquez brothers showed how vulnerable it is. The killings also shed light on the collusion between local police and organized crime. Jalisco attorney general Eduardo Almaguer said his office was investigating municipal policemen who had arrested the suspected murderers in an altercation earlier that day, only to release them moments before the shooting. Most of the pilgrims arrived to the sound of tribal music played in the middle of the night, with coyotes howling in the distance and lightning flickering over far-off peaks. Wearing traditional dress and elaborate feathered hats, the Wixárika sprinkled an offering of ground maize over the campfire and chanted for hours in a trance-like state. 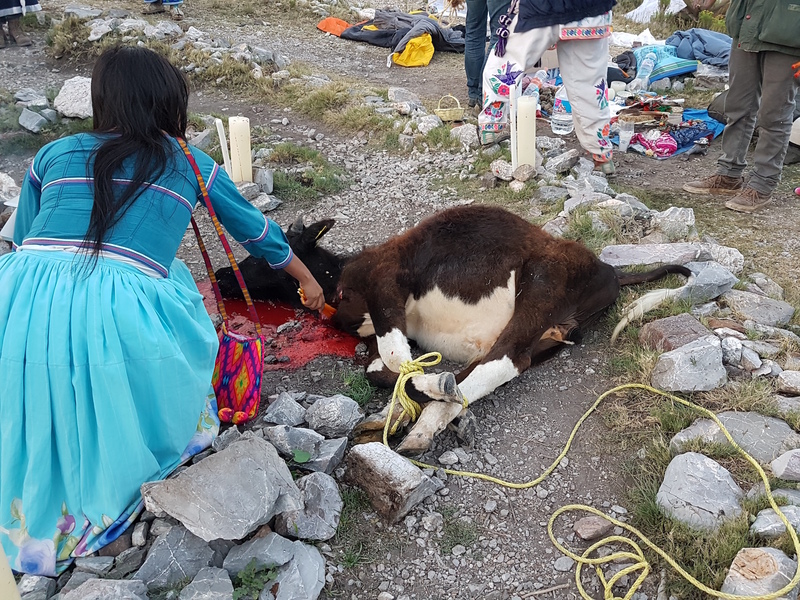 After sacrificing the calf at dawn, they prayed in a tiny chapel whose walls are lined with animal scalps and psychedelic artwork. Then came a breakfast of peyote, orange slices, animal crackers, and Coca-Cola. Under Mexican law only the Wixárika can consume peyote, but New Age enthusiasts are eagerly simulating this experience by partaking in an illicit peyote-based tourist trap booming in nearby Real de Catorce. The dusty former ghost town is brimming with non-indigenous fixers offering tourists peyote and a place to trip. For the Wixárika, the trend adds insult to injury. With police turning a blind eye to recreational use from tourists, Mijarez warned that outsiders are now testing their limits and illegally exporting the plant. If supply were to run out, the Wixárika would lose contact with their gods, further undermining their ability to resist other threats like mining and organized crime, Mijarez said. Duncan Tucker is a freelance journalist based in Mexico.